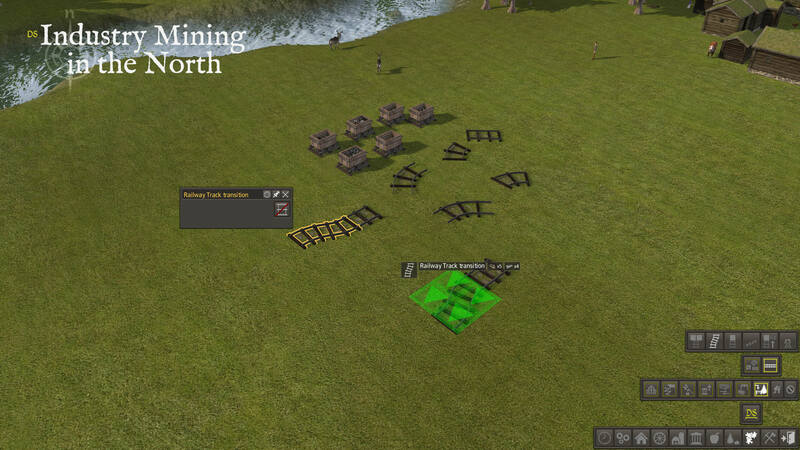 also: there is a transition piece – a 2×2 piece from that changes a 2 tile to 1 tile railway. Railway Track straight – straight piece, 2×1 tiles. 8 work to build & 3 wood + 2 iron. Railway Track half left turn – left turning piece, turns 45degrees, 2×1 tiles. 8 work to build & 3 wood + 2 iron. F-key variants. Railway Track half right turn – right turning piece, turns 45degrees, 2×1 tiles. 8 work to build & 3 wood + 2 iron. F-key variants. Railway Track angled – angled piece, 2×1 tiles. 8 work to build & 3 wood + 2 iron. 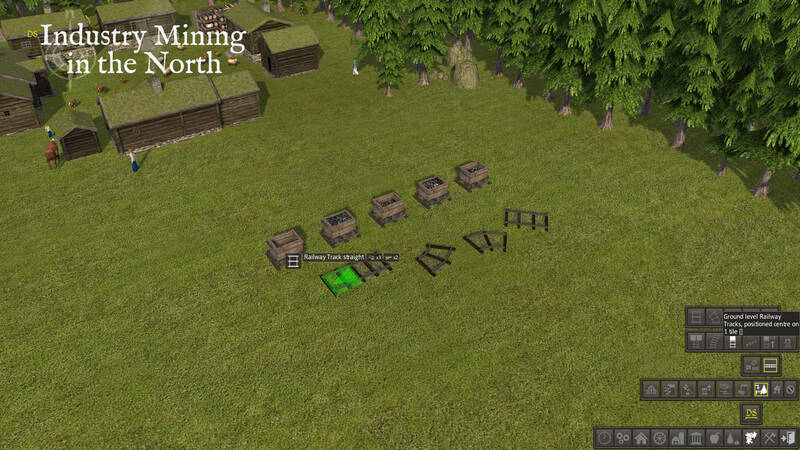 Rail Cart – decorative, all terrain/road build-able (not water). 2×1 tiles. free to build. F-key variants. Railway Track straight – straight piece, 1×1 tiles. 8 work to build & 3 wood + 2 iron. Railway Track half left turn – left turning piece, turns 45degrees, 1×1 tiles. 8 work to build & 3 wood + 2 iron. Railway Track half right turn – right turning piece, turns 45degrees, 1×1 tiles. 8 work to build & 3 wood + 2 iron. Railway Track angled – angled piece, 1×1 tiles. 8 work to build & 3 wood + 2 iron. 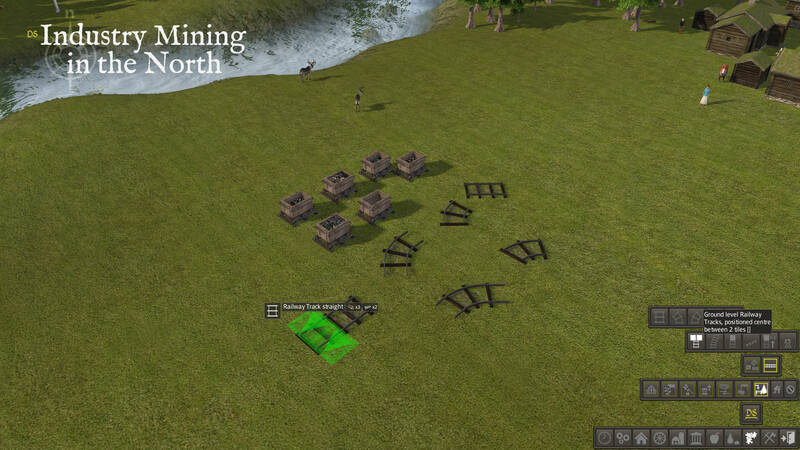 Rail Cart – decorative, all terrain/road build-able (not water). 1×1 tiles. free to build. F-key variants. Railway Track transition – Transition piece, on ground level, from 2 tiles wide to single tile. 2×2 tiles. 21 work to build & 5 wood + 4 iron. F-key variants.